Repetition Helps You Remember. It Doesn’t Help You Think. I’m not a fan of overly repetitive study strategies. 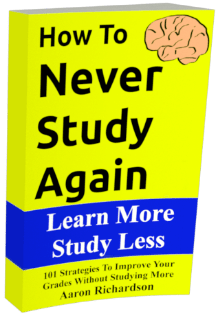 Study strategies typically need some amount of repetition to work but for every bit of repetition you add to a routine you need to squeeze out a little bit of the logic. Repetitive study strategies tend to work because they present information so many times that our brain thinks it must be important. At first your brain can come up with good reasons to think about the information. You might start noticing the sound the words make. You might find a rhythm to the knowledge.You might start thinking how that information relates to other stuff you know. After a few minutes of repetition your brain starts to run out of easy things to think about related to the information. It may recall some of the previous thoughts you have but it gives up on developing new distinctions. And, at a certain point, the information just becomes second nature. You have a trigger for the information and you remember it without the strange detours. Remembering information as second nature feels really good but it’s rarely objectively better than remembering it through strange detours. The funny thing about the strange detours is that they encourage your brain to turn up new stones and remember those stones better too. For example, remembering 1898 was the start of the Spanish American war might make you think of Roosevelt and his rough riders that fought there. The next time you’re wondering when Roosevelt was president you may not know it off the top of your head but you’ll quickly realize it couldn’t be 1898 because he was busy in Cuba. You’ll suddenly be close to right on other information. When information becomes second nature you stop making those extra connections with other information in your brain. And, really, as soon as those new connections stop being made it’s probably time to stop studying that information. Because of my memory problem, I have to repeat information for a week before I remember the small details that teachers love to ask about. The first two-three times I read notes or a textbook, I do it to understand the topic and get a general idea of it. Then I repeat. I wish that teachers and lecturers were more interested in checking if their students understand the topics and less about memorization of superfluous details.